We Now Have Solar Power! OK, our solar power system actually got installed a week ago, but I wanted some photos so I had to wait until the weekend. Anyway, we now have solar power! 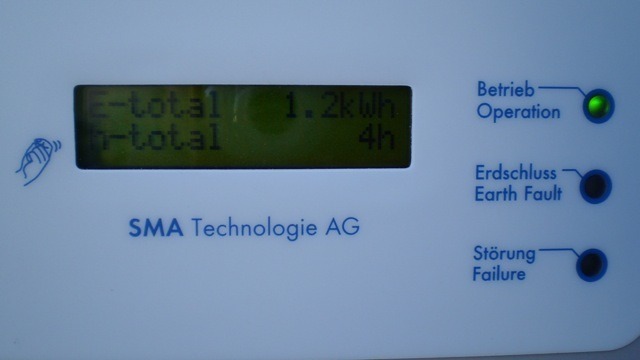 We got a 1 kW grid-connected solar power system from Earth Utility. Once again (we previously got solar hot water from them), their service was great and the finished job looks very neat and professional. The electrician who did the installation was very knowledgeable and friendly. WARNING: Earth Utility appears to be in trouble (updated 28-04-2010). The Sunny Boy inverter has a display on the front that shows total cumulative power produced, daily power produced, hours of operation, and instantaneous power and voltage. My only criticism of it is that you can only view those figures while the sun is out. If you come home after dark and want to see how much power was produced during the day, you can’t. So how much electricity does the system generate? One the clearest, brightest day we had this week it generated 4.3 kWh. That’s pretty good, considering we’re only about 5 weeks from the winter solstice (the sun’s lowest path across the sky). It’ll be interesting to see how it performs over summer. Because our block slopes up from the road and we have a roof over our front deck, none of our solar stuff is visible from the street. It’s kind of a shame, as I’d really like people to see that normal houses can be retrofitted with this kind of technology. If you’re at all interested in getting solar power, start making enquiries now. The current rebate scheme will end on June 31, and is going to be replaced with an inferior one. The only upside is that the new scheme will not be means tested. There’s still time to get the ball rolling – you just have to get your rebate application in before June 31, and then you’ll have 9 months from the date of approval in which to install your system. Solar Power On It’s Way! Congrats.I think more and more people will use solar if they can see your solar system. That is so exciting. I’m not that hot with figures, so you say how many kws you had on a day; what does that mean practically – what can you run from that? We’re hoping to get a small panel at the beginning of next month to run lighting from – I can’t wait! @Mrs Green: Our household is currently using about 16 kWh per day for everything – lights, oven, TVs, computers, fridges, etc. That’s not a particularly low figure (we have a lot more “opportunities for improvement”! ), but it’s below the Australian average for a household of five. So we’re generating about 1/4 of our total electricity use. Darren, I bet you’re overexcited with this solar panel, isn’t it? 🙂 By the way, congratulation, my friend. You’ve shown a good role as a person who concern about the environment! By the way, do you mind to tell us, how much you spent for this solar power installation? Nice one Darren. You are certainly being a great role model for solar technologies which reduce one’s carbon footprint. For the halogen downlight problem, you can do something about these power hungry devices without needing any new wiring. See http://www.todae.com.au/LEDLighting/Down_Lights_Guide for some great information (i.e. LED and CFL replacement lights). Note that this was found by doing a quick search for “energy efficient replacement for halogen downlights” on Google. I am sure that there is some other information out there as well. @Wilson: Aww, thanks :-). 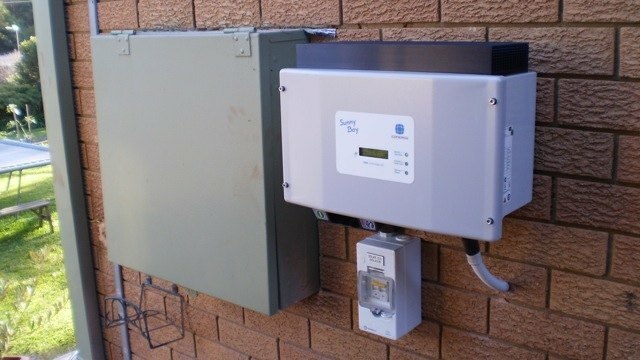 I don’t mind sharing the numbers – after rebates, this system cost us $2400 for the panels, inverter and installation, plus another $275 for the meter and grid connection. So $2675 all up. @Jason: I’ve looked into LEDs. Unfortunately, we’d also need to replace the transformers if we installed LED lamps. The existing transformers (one per downlight) are designed to operate at 12 V with a 35-50 W load. When run with a 3W or 6.5W LED load, their output voltage is too high and they cause the LEDs to fail prematurely. If I’m going to get up in the roof to replace transformers, I may as well convert the fittings to 240 V downlights that can take CFLs. While LEDs are the way of the future, right now they’re very expensive. The 3W ones (dim – equivalent to 20W halogens) are $50 each, and the brighter 6.5W ones are $100 each! And that doesn’t include the new transformers. We’ve got something like 30 halogen downlights in the house, so we’d be looking at over $2000 to replace them all. Ouch. I figure if I have to get up in the roof anyway, I may as well try out the cheaper alternative of converting the downlights to 240 V CFLs. I’ve got 10 CFL converter kits to try, but I haven’t got around to installing them yet. It’s on the list :-). At some point in the future LEDs will come down to a reasonable price, and I’ll then be able to replace the CFLs with 240 V LED units as they wear out. My advice to anyone building or renovating is to avoid any kind of downlights for general room lighting. They don’t light rooms very well unless you put in lots of them, and they’re going to either be expensive or inefficient. Better to stick with traditional baton or pendant lights with nice fittings. Exciting! I must admit i’m still in two minds about whether to get solar….We purchase 100% certified green energy. I figure that by us using mains green energy we are encouraging energy providers to generate more green energy and develop the technology required to generate this green energy??? But i’m still in two minds???? @Tricia: We’d been putting off switching to green power while we waited for the solar panels to get installed. We were also locked into a 2-year contract with Energy Australia that just ended. We’re now switching to Origin – they pay a premium tariff for the solar power we generate, plus their green power plans are quite reasonable. If you’re using green power, then installing solar panels won’t make you any ‘greener’. One reason we did it was because we want to support the home solar industry and we’d like to see more of them out there – a distributed power generation network is more resilient than a centralised large-power-station network. 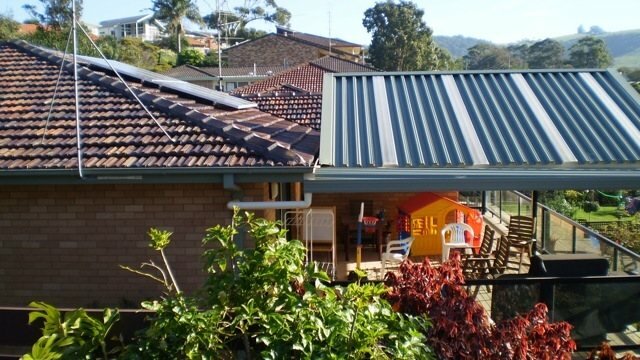 Another big factor is the proposed NSW solar feed-in tariff – if the tariff rate is similar to other states, it will make solar panels economically attractive once it comes in. And electricity prices are set to rise by 20% in the next few years as well. WHERE YOU BUY FROM? SOUNDS PRETTY CHEAP! WHAT BRAND? @Roger: As the article says, we got the system from Earth Utility. We signed up late last year when they were running a really good special. I think their current price is more like $3,300. They do have an interesting option where you pay nothing up front, just pay a monthly charge. Well done mate! It is great to see another member in the Solar PV club. 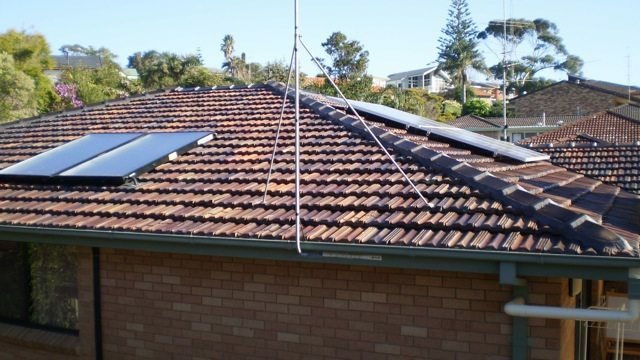 You will find that now you have your own power plant on your roof, you and your family will find very creative ways to save electricity via energy efficiency. I had a similar lighting problem to you, but I simply bought a few tall lamps and fitted them with CFL’s. Problem solved! @Gav: It’s a great feeling, isn’t it? We only generate about 1/4 of our own power (I know you generate all of yours), but it still feels awesome to see that power meter spinning backwards in the middle of the day. I was thinking of floor lamps too, but we have small kids that tend to fiddle with and pull over stuff like that so it’s not real workable at the moment. Plus I got some free downlight conversion kits via our Council sustainability project (Sustainable Illawarra). I know a guy who’s pretty negative on the CFL downlights, though – he reckons they’re quite dim and not much good. I’ll have to try it and see – and blog about it :-). Fantastic! I like the look of them on the roof. It is a great site to see but unfortunately not one I see around my area very often. @Melinda: I actually like the look of them too, and am slightly disappointed that mine are not more visible! I have had people comment to me that they like them being discrete, though, so maybe that might encourage others who were put off by the ‘eyesore’ factor. Congrats on getting your solar panels installed Darren! It is so rewarding to be producing your own electricity! 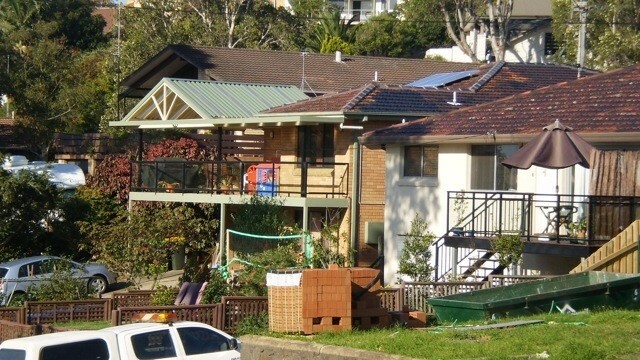 Gosh you did get a good deal – we paid $4,400 to have our 1kW panels installed in September last year. Ouch! It’s great to see the prices are coming down to make them more affordable, and that there are occassionally really great deals like the one you took advantage of. As you mention, it’s good to get in before the end of this finacial year for the best rebates. I have heard that any applications received right up until the closing date should be covered under the existing rebate system. @HappyEarth: Yep, when I saw this deal from a trusted supplier I jumped on it. It was late last year when the stock market was in a shambles, the means test on the rebate had slowed sales, and Christmas was looming. I think companies were just looking to get some cashflow and keep their business ticking over. @Jeff: Thanks for sharing your experiences with CFL downlights. I had heard similar. I think the CFLs will be fine for hallways, loungeroom, TV room, etc. I suspect that we’ll end up keeping halogens in the kitchen, where you need good task lighting, for now. Maybe we’ll even spring for some LED lights later on if they’re bright enough. Dropping your lighting from 325W to 102W is pretty good – that’s a 70% saving! @Mel: Good luck, it can be a bit daunting trying to choose which one to go with. If you remember, please post back or email me and let me know who you chose in the end. 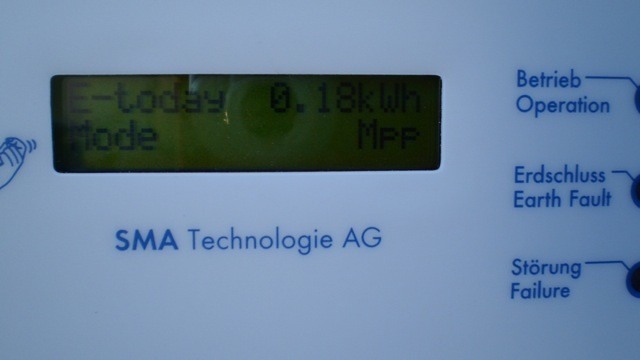 We have had solar panels (30 x Kaneka 60W thin film) for 14 months and have monitored our power usage and ‘sunpower’ over this time. Since installation, in March 2008, we have generated 3166 kWatts of ‘sunpower’ and used 2700 kWatts (daily average 6.3 kWatts/day). 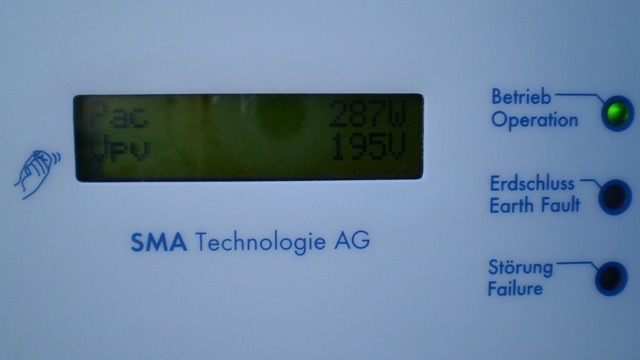 The power saving has been aided by the use of energy saving products within the home and a solar hot water system. Having no kids also helps! @Michael: Wow! You’re doing great! It must be awesome to be a net exporter of clean, renewable electricity. The surprising thing to me in all this is how much electricity you can save without impacting your lifestyle, just by make smart appliance choices and adopting sensible habits. I knew we were a bit wasteful, but I never knew just how much. @Chrissy: They seem to still generate a little. It’s been averaging between 1.0 and 2.0 kWh this week, with cloud, some rain, and occasional moments of sunshine. That’s better than I expected! It’s interesting to me that they don’t just drop to 0. @Chrissy: I guess in a nutshell, it’s generating about 1/4 of its maximum output even on a cloudy day. I didn’t expect it to work that well. Be careful with the efergy meter – it’ll drive you nuts. Switch on the oven, kettle, toaster and a bunch of lights at the same time, and watch the dollars fly past! It’ll make you want to sit in the dark :-). Well I think that’s great considering the amount of cloudy days we had! Solar Energy is one of the best sources of clean and green electricity. I think that we should build more efficient solar thermal power plants and solar cells. Have installed 2kw system in April generating arounds 6kw a day. Not bad considering my system is aligned NE and cant wait to see what Summer will bring. I currently use around 11kw a day so you can see that it will certainly pay for itself. I using a Sunny Beam Inverter with the Wireless PV System Monitor which graphs my daily usage as well as shows the past 31 days generation. I have replaced some lights with the cfls however still working on the halogen down lights and some G9s which have no solution for at this stage. I can certainly recomend people Generating their own power and feeding the Grid as we all need to do something for this planet … working on water next….